Weir-Jones Engineering Consultants have developed the Seismic "Rockfall™" Detection System (SRFDS), which is an evolutionary alternative to traditional slide fence technology. This revolutionary system relies upon acoustic signature recognition to determine if and when rocks or other hazardous debris fall onto the right of way. The exact size and location of the hazard is determined in real time by utilizing highly sensitive seismic sensors together with a 24-bit data acquisition system. Once a valid event triggers the system, this information is immediately sent as a digital warning signal to the railway operator. The Rockfall™ system eliminates the high maintenance costs and continuous false alarms generated from slide fence systems. 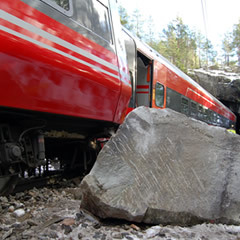 Weir-Jones has over 40 years' experience with rock fall and stability hazard monitoring systems. Our clients include railway companies, Provincial and Federal Ministries, Crown Corporations, and mining companies.